I was so happy to see so many great book activities to accompany well loved storybooks in last week's Mom's Library. I chose to feature several book activities to go with books. Many of these picture books will likely already be in your home library! Mom's library is a weekly link up that I co-host along with True Aim and several other great bloggers. You can find and share great resources in this linky party. It is filled with parenting tips, recipes, book activities, crafts, devotionals and more! (If you are viewing this post in an email, you'll need to click over to ready-set-read.com to view the link up). Not only can you get great ideas right here in the linky party, you can find many of the ideas from previous Mom's libraries on the Mom's Library Pinterest board. I'd love if you'd follow me on Pinterest while you are there! Wonderful resources! Thank you so much. Cute crafts, again. 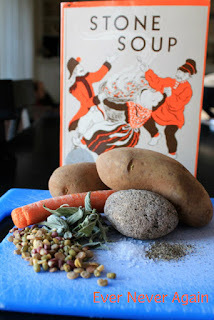 Thank you for featuring my Stone Soup post! I hope you have a wonderful weekend, and thanks for sharing all these great ideas! I love the activities you shared this week!